I don't have any particular knowledge about diesel pushers but in 30 years of collecting Porsches I have learned a couple of things about buying vehicles from owners who don't maintain them - the mess you see is only the tip of the iceberg and the purchase price is just the ante. Most expensive vehicles you can buy. I remember when you looked at the odometer and the last digit did not line up that was an indicator that it had been set back. They both look like big projects. If you are up for that. Pick the one without any water leaks in the shell. John shares some good advice above. 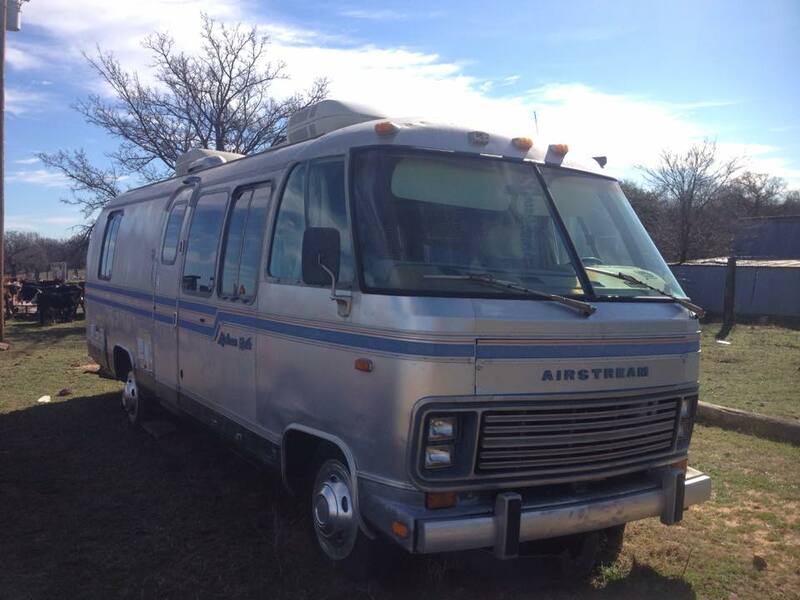 I don't know much about the fiberglass era motorhomes other than use a moisture meter thru out the coach, ceiling, walls, and floor when you go to evaluate them. Realy low buy in price is only the start, do your best to determine what the needs are. Even tho it's in mid project, try to check out all appliances etc. Could be a deal because of the circumstances. Or a money pit. I was caught up with the quest for a D P classic, then realized the costs involved in getting one and the higher cost of repairs etc. not that much difference in function to justify the additional cost for me. At least the second one has its dash and a drivers seat! The second one shows signs of multiple roof leaks, the one over the driver seems to have reached the wall. We had a member post of similar damage on his coach. He ended up gutting it to the framing. Not clear if you are into going that deep. How is the condition your current rig? I'd think you may be well situated to gage the condition of these type of rigs than those of us that are into the aluminum skinned types. For $8,500.00, does the shovel that's holding up the ceiling come included in the deal? If not, that's a deal breaker for me. The first one for $4,000.00. I think the guy had a heart attack when he looked above his ceiling. Again, thank God I have a Classic. Yes I had to replace my subfloor, but that's it. Of the two I'd go for the '94, the 93 looks like it has extensive water damage. If the '94 drives well I'd look it over really close for water damage but for the price you could do some fixen. Hope the MoHo isn't what caused the guys heart attack! Also as mentioned I'd rather have an aluminum MoHo, but you could always sell later if you want. Agree with previous posts. Start with figuring out what doesn't work. Leaks - look for delamination on sides. 8500$ one definitely has leaks by the fan and shovel area. Figure removing the headliner, overhead cabinets, removing the Luan, replacing the foam, luan and headliners. Probably damage in the wall. Depending on how long it has leaked the steel frame members may need attention. From the general view of it it doesn't show much pride of ownership which means you won't find a lot of the problems until you dig in. I would expect to spend $20k if you do most of the work yourself. Recommendation is to wait for a well cared for one but if you go ahead I would look at the 4K one if it has minimal leak damage and major systems check out. My PO paid $15k and then another $10k and sold to me for $9k after a year. How about buying both of them and combining what is good in each? This thread is getting depressing. We have a 94 Land Yacht DP that we've used and loved for 112,000 fun miles while keeping it inside when not traveling, We've had to make repairs but is that not what we should do. It'always ready to go on vacation. When I see these abused and abandoned Land Yachts, it makes me sick! Sometimes we talk about selling it but these kind of threads tell us it's worth less than $16K, or thses junker prices and we say , #1 might as well keep it or #2 that's a lot of Hampton Inn rooms. Decisions, decisions. What to do after two class A's and 27 years?